This easy chocolate muffins recipe combines two of our favorite things: fresh strawberries and chocolate! 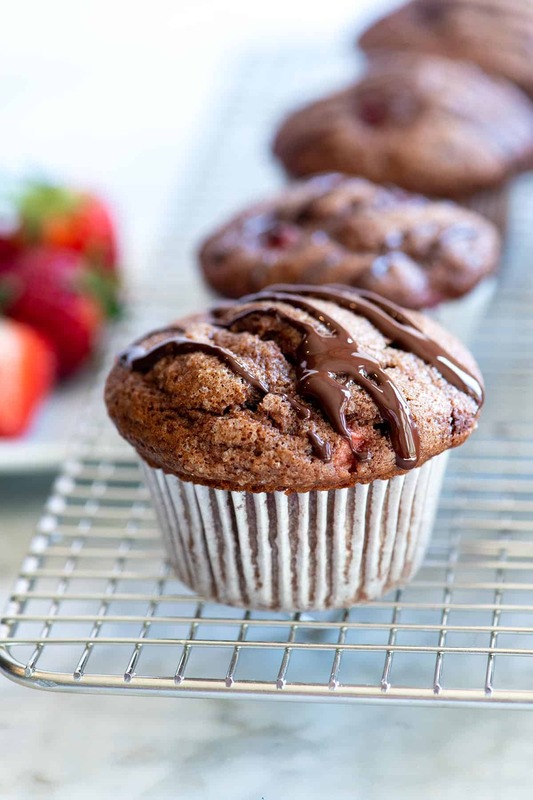 See how to make tender muffins packed with strawberries and topped with a chocolate drizzle. 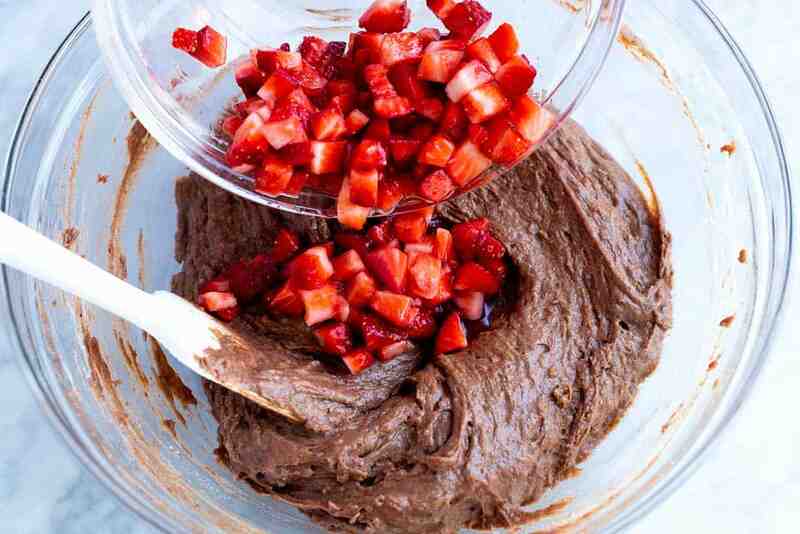 Jump to the Strawberry Chocolate Muffins Recipe or read on to see our tips for making them. 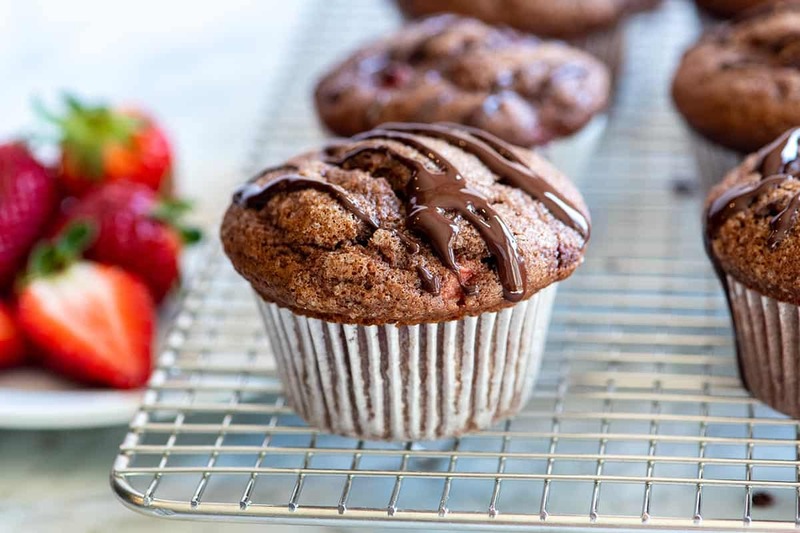 We’ve shared lots of muffin recipes with you already, but this fresh strawberry and chocolate version is my favorite. 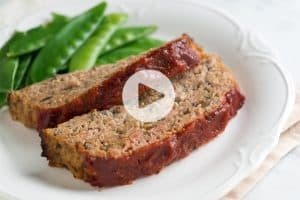 Thanks to yogurt and cocoa powder, they are tender, bake nice and tall and are easy to make. It’s easy to make the best chocolate muffins, especially if you know our tips! #1 Bloom your cocoa powder. Have you ever heard of that, sounds funny right? It’s actually really cool. 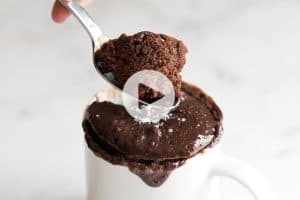 If you combine cocoa powder with a hot liquid it helps to “bloom” the cocoa, which makes the cocoa powder taste even more rich and chocolaty than if you were to just add cocoa to the dry ingredients. It’s really common to see cocoa powder mixed with hot liquid in chocolate recipes. Take our outrageously fudgy brownies, for example. In that recipe, we melt butter with sugar and cocoa powder before mixing in any other ingredients. This makes the brownies taste rich and ultra chocolaty. 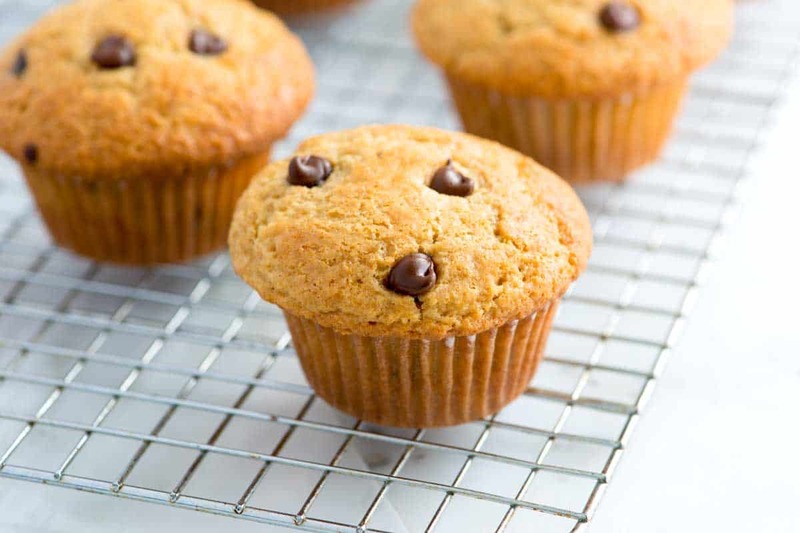 In this muffin recipe, we do exactly the same — warm butter is whisked into the cocoa powder and sugar. #2 Don’t Over-mix the batter. If you’ve been following our recipes for a while, you’re probably tired of us telling you not to over mix when it comes to muffins (this also applies to waffles, pancakes and quick breads). When combining the wet and dry ingredients be gentle and fold the dry ingredients into the wet. 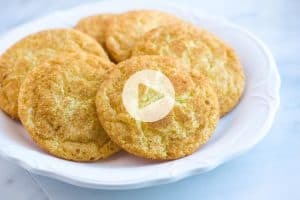 All you need to do is stir gently until any streaks of flour disappear and the batter is smooth. 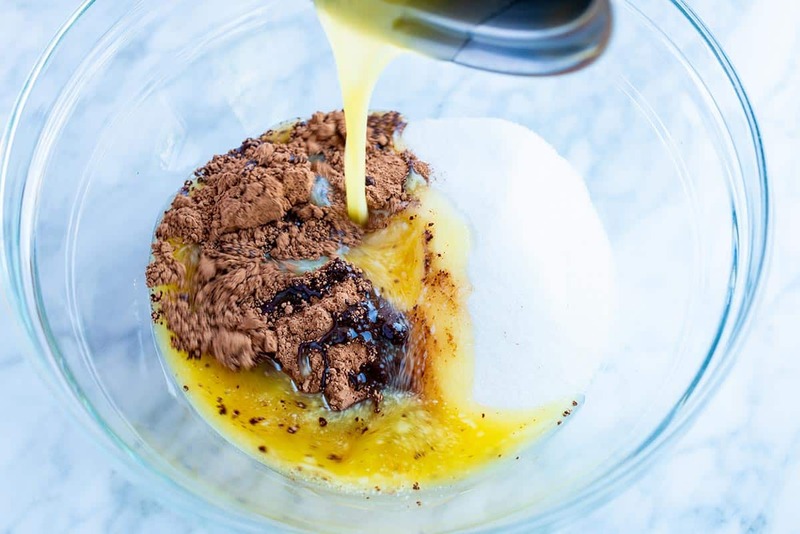 There’s no need to beat the batter or use an electric mixer. Over mixing makes muffins heavy. #3 Add extra chocolate. Okay, this one seems obvious, but by drizzling a small amount of melted chocolate on top of the baked muffins, you bump up the chocolate level. The chocolate eventually firms and makes a nice top for the muffins. 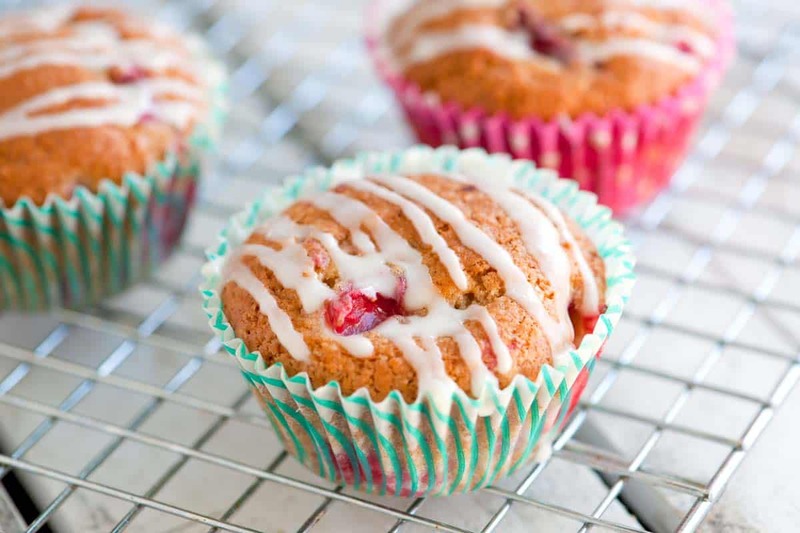 You could add chocolate chips to the batter, but personally, we love leaving the inside of the muffins for the strawberries. Speaking of the strawberries, we’ve got a trick for you. Unless you are lucky enough to go to a strawberry patch and pick a perfectly ripe berry, your strawberries might be slightly underripe (you can tell from the white tops). That’s okay, though. Just before making the batter, chop the strawberries small then toss with a teaspoon of sugar. The sugar acts the same way salt does with other foods. It helps to season the berries and brings out more flavor. It is important to chop the strawberries small, otherwise they will fall to the bottom of the muffin. Tossing the chopped strawberries with a teaspoon of sugar also brings out some of their sweetness and makes them taste more like a strawberry. If you are using perfectly ripe berries, tossing with the sugar is not necessary. We drizzle the tops of each baked muffin with dark chocolate, but any chocolate will do — use what you love. Heat the oven to 400 degrees F. Line 12 standard-size muffin cups with paper liners. In a small bowl, mix the chopped strawberries with a teaspoon of sugar then set aside. In a medium bowl, whisk the flour, baking powder, baking soda, cinnamon and the salt together. In another large bowl, whisk the cocoa powder and sugar together. Melt the butter then while it is still warm, whisk into the cocoa powder and sugar until blended and the mixture has cooled slightly. Add the egg, yogurt and vanilla. Whisk until smooth. Switch to a large rubber spatula. Scrape the sides and bottom of the bowl then add the dry ingredients in 3 parts, stirring gently until they disappear and the batter is smooth. Fold in the strawberries. Divide the batter between muffin cups — the batter will come close to the tops of the paper liners. Sprinkle a little sugar on top of each muffin. Bake muffins 15 to 20 minutes or until tops are no longer wet and a toothpick inserted into the middle of a muffin comes out with crumbs, not wet batter. Transfer to a cooling rack. When the muffins are mostly cool, melt the chocolate. Since it is such a small amount, using a microwave is best. 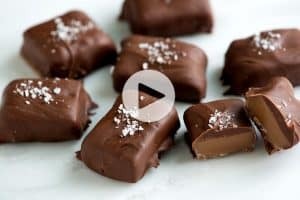 Add chocolate to a small microwave-safe bowl. Microwave for 10 seconds, stir then microwave for another 10 seconds. Repeat this process until the chocolate has melted. 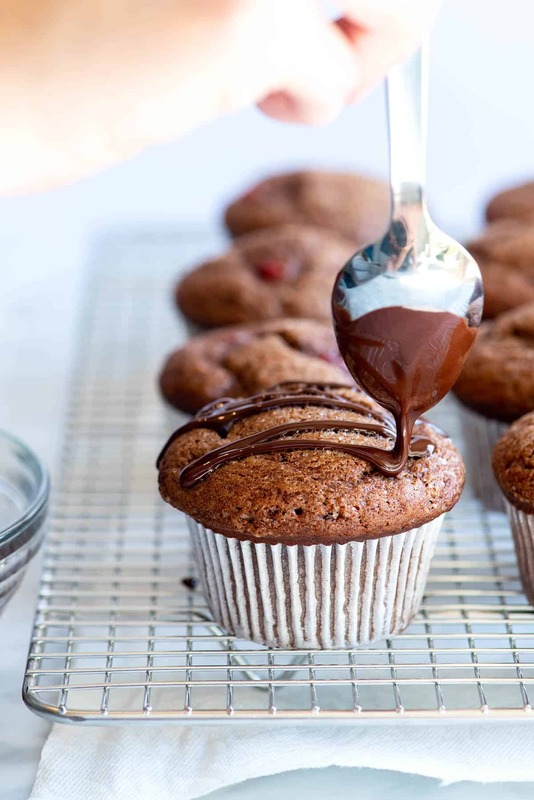 Drizzle the melted chocolate over muffins. Adding/reducing the sugar: 3/4 cups of sugar is just right for us, for slightly sweeter muffins, use 1 cup of sugar in the batter. To reduce the sugar, choose yogurt with the lowest sugar content and consider reducing the sugar called for in the recipe by 3 to 4 tablespoons. What yogurt to use: For the most tender muffins use plain full-fat yogurt. Low-fat or 0% fat yogurt can be substituted, the muffins will just be a little less tender. If you use Greek yogurt, you may find that you need to add an extra splash of liquid since it is thicker than regular yogurt (milk or even water will do). Finally, keep an eye on the sugar content of the yogurt you use. Plain should have the lowest sugar content, while a vanilla flavored yogurt will have much more sugar (making the muffins more sweet). To store the muffins, place them in a plastic bag, seal, and store at room temperature for 2 to 3 days. To freeze, wrap them tightly in aluminum foil or place them in freezer bags. Freeze for up to 3 months. I went looking for a waffle recipe and clicked on your recipe and after that looked up this recipe. What a wonder for waffles and muffins, and with standard ingredients as well. I don’t even need a Belgian waffler, nor commercial grade muffin pans. Yay. I got so tired of filtering through recipes with almond flour, etc. I think it is wonderful if that is what works for folks, but we do not require those specialty ingredients for health in our household. Oh, and lived in Seattle and the PacNW for most of my life. I’m in TX now and miss it terribly. I shall have to consider moving yet again, at least for one last time. Why die a stranger in a strange land, right? May the forks be with you. Great muffins! So tender more like cupcakes. Recipe perfect, all the batter measured into the pans perfectly. Did use half coconut/butter, very light, not overly sweet, just delicious. Hi Linda, You can definitely freeze the muffins. Just make sure you cool them and then wrap them well before placing into the freezer. Delicious cupcakes! Love the moist chocolaty flavor with a hint of strawberries. My family loves them.